In less than a year in office, Donald Trump has strained relations with America's closest allies. Why? United States President Donald Trump has been famously (or infamously) opposed to the military, diplomatic, and financial responsibilities undertaken by previous US administrations. Undermining traditional American leadership in alliances like NATO has been a top priority of the Trump administration, accompanied by deteriorating bilateral relations with key allies. Economic and military relations between the United States and its friends and allies are fatigued under 'America First' diplomacy. Trump's apparent personal support of Britain First has been a point of contention for many Brits, and his Twitter spats with UK Prime Minister Theresa May have precluded that country from a presidential visit for the time being. Criticisms of European immigration policies have earned harsh condemnation from political leaders and human rights advocates, prompting more Trump tweetstorms alienating America from its more progressive allies around the world. Simultaneously baffling and disconcerting, the question occupying most foreign policy analysts' minds is this: if Trump's priority is "making America great again," how do strained diplomatic relations achieve that end? The most fundamental alliance in the western world is widely regarded to be NATO. It's the only thing keeping the Baltic countries out of the sphere of Russian influence, and it was the catalyst for the ongoing Ukraine crisis. NATO expansion during and after the 1990s secured Baltic and Eastern European countries from Russian political influence, but it's also caused increasing tension as the Russians feel threatened by the geographic proximity of NATO military equipment. Russia has repeatedly condemned NATO expansion as military aggression, especially in former Soviet territories. Ukraine is the cornerstone of Russia's hybrid war against the West, and its accession to the EU or NATO would represent an unacceptable loss to Putin's Russia. Why, then, is Donald Trump continuing his assault on NATO cohesion? Demanding repayment for the years of American defense spending simply does not help to foster relations with European allies, especially as Putin becomes increasingly daring in his international incursions. If the North Atlantic Treaty Organization fails to provide a credible collective defense force, its enemies and rivals will have prevailed. The United States' closest ally, at least geographically speaking, has become increasingly defensive in the face of NAFTA renegotiations. Canada's footing is a response to an aggressive American posture, each trying to protect their own economic interests. Even worse is the relationship between the US and its other NAFTA partner, Mexico. Trump's planned border wall has caused tensions between the two strategic allies, even stoking racial divisions within American communities. The administration's criticisms of immigration policies are underscored by some of its supporters' racist tendencies towards Latino immigrants and residents. Stringent new visa policies for other strategic Latin American allies, like Colombia, have earned enmity from historically pro-American societies. Outside the Western world, Trump's actions are increasingly worrying other key US allies. His tweets provoking North Korea are less than appreciated in South Korea, the likeliest target of a North Korean attack. American presidents have previously taken steps to ensure the safety of allies like South Korea and Japan, but Trump's bellicose rhetoric towards the North shows little concern for the millions of people in allied nations who would be the first targets of the Kim regime. Threats of nuclear war with the North Korean regime are worrying global and regional allies, prompting concern for the stability of the American administration and of the regional status quo. Although maintaining the status quo benefits nobody more than the Kim regime, pursuing change by resuming the Korean conflict would likely cost millions of lives. Volunteering South Korean and Japanese lives is not likely to improve relations with those key regional allies. Trump's foreign policy strategy has been inconsistent. His stated intent of rebuilding relations with Russia has so far only been achieved rhetorically, and past criticisms of heavyweights like Saudi Arabia and China have apparently been forgotten. His grand strategy is virtually indecipherable, with decisions seemingly being made on a case by case basis. The most glaring error in Trump's conduct of foreign policy to date is the slow dissolution of America's most fruitful alliances. He forgets that America was great because of its leadership in both bilateral and multilateral relationships and organizations, not because of its prewar isolationist tendencies. Trade dominance and military supremacy in concert with key allies helped to foster the decades of American hegemony, but the rupture of Western alliances is aiding the rise of rival global powers. Dictatorships and pseudo-democracies seem to have increasingly stronger acceptance from the American administration, to the detriment of international democratic proliferation. If this pattern continues, it will be up to other powerful Western and democratic nations to take up the mantle of responsibility against the spread of authoritarianism. 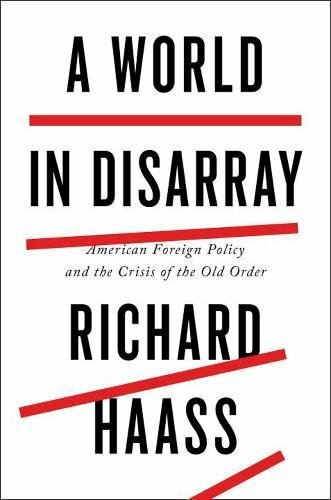 Today's book recommendation is A World in Disarray by Richard Haass.